Plate from William Aiton’s Hortus Kewensis (volume 2) of 1789. Smithsonian Libraries copy; digitized version with multiple holdings in the Biodiversity Heritage Library (link here). Long before colonists landed on the shores of New England, Native Americans harvested cranberries from peaty bogs and marshes. In the present day, the Aquinnah Wampanoags of Martha’s Vineyard celebrate their most important holiday, Cranberry Day, on the second Tuesday of October. Called sasemineash by the Narragansett and sassamenesh by the Algonquin and Wampanoag tribes, the tart berries were an important food source, as early European settlers came to discover. To make pemmican, the fruit (or another berry) was incorporated with pulverized dried fish or meat and melted tallow, and formed into cakes baked by the sun. An endurance athlete of today knows that a proper combination of fat and carbohydrates is necessary to fuel the body. Pemmican was the original power food as this provision provided energy, lasted for months, and was easily portable on long journeys. 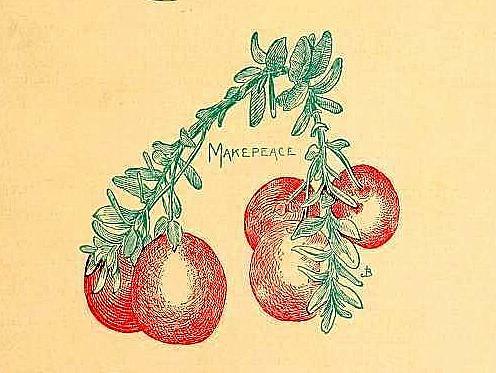 Following the Pilgrims reliance on the fruit, cranberries became vital for North American fur traders and explorers during the long winter months. Native Americans also made the first cranberry sauce. Poet, lawyer and chronicler of the French exploration of Acadia (Maine and the Maritimes in Canada) Marc Lescarbot (c. 1570-1641) observed natives eating cranberry sauce with meats in the early 17th century. He also came to the conclusion that cranberry jelly was excellent for dessert. However, cranberry sauce was likely not shared between the Pilgrims of Plymouth Colony and the Wampanoag Nation, who had been harvesting cranberries for 12,000 years. Biodiversity Heritage Library digitized copy, supplied by the U.S. Department of Agriculture, National Agricultural Library. 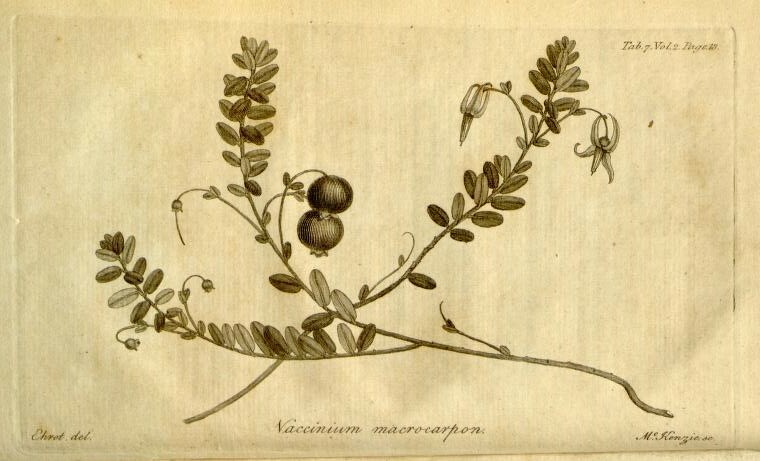 There is a cousin to the red cranberry in England (Vaccinium oxycoccos), and sour fruit sauces or relishes there were traditionally served with meat. Colonists soon adapted the acidic, native cranberry to a familiar cuisine where fruits were often used in both sweet and savory dishes. 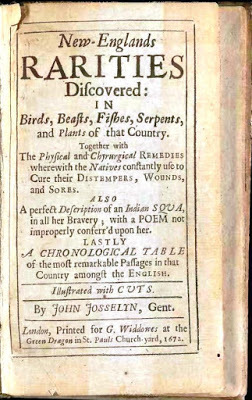 One of the earliest references of meat being eaten with cranberries is in John Josselyn’s New-Englands Rarities Discovered (printed in London in 1672). 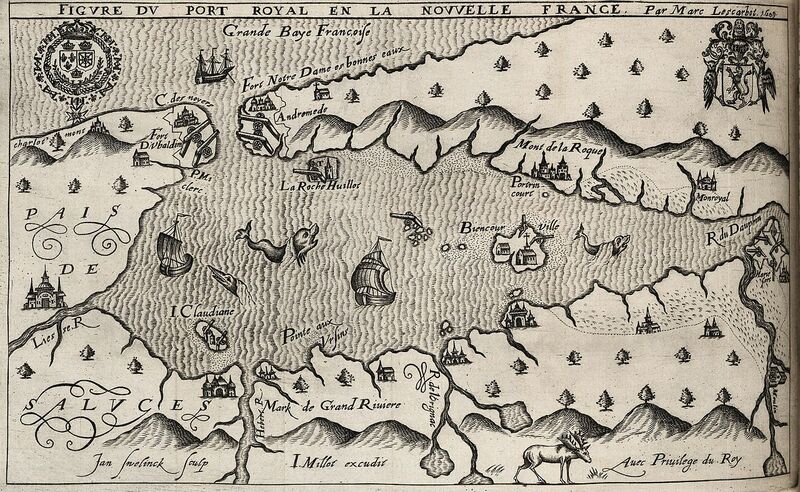 This is a charming narrative of the author’s long stays and a catalog of what he saw and learned in the New World in 1638 and, returning, in 1663. By the mid-17th century, with the growth of the slave trade from the West Indies (Barbados, Jamaica and the Leeward Islands), sugar became widely available in New England and cranberries were used more frequently in pies and tarts. In honor of present-day Thanksgiving traditions we will mention that Josselyn also observed “pompions” (pumpkin) pie and for the first time in print fully describes the wild turkey. 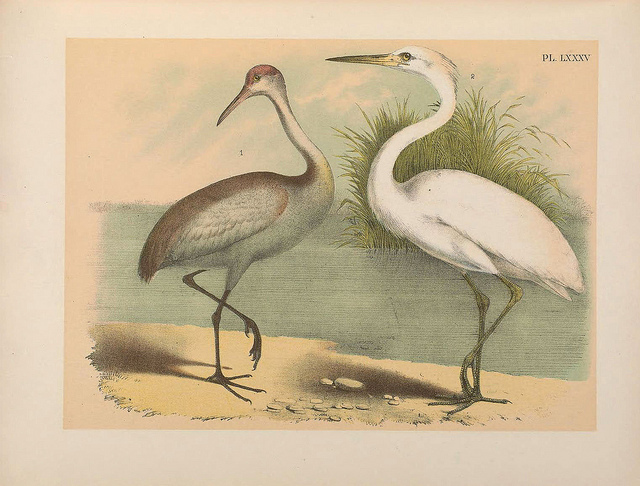 The Sandhill Crane, the bird that gave the berry its name, and a Great Egret in The Birds of North America, by Jacob H. Studer (New York: Published under the auspices of the Natural Science Association of America, 1903). 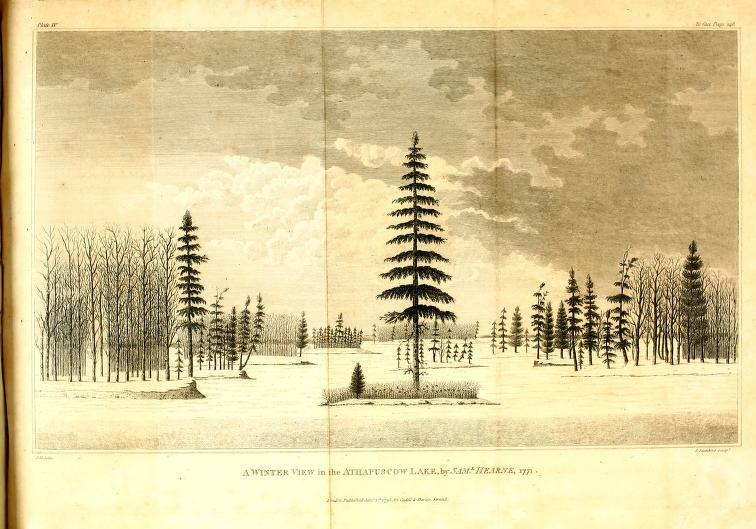 Smithsonian Libraries’ copy digitized by BHL. 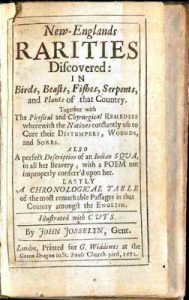 The English author was interested in the healing properties of organic materials as applied by Native Americans (whom he admired) and settlers (he was not so fond of the Bay Colony Puritans). So Josselyn relays the information that cranberries “are excellent for the Scurvey. They are also good to allay the furvour of hot Diseases.” Apart from fevers, other medicinal uses of cranberries by the indigenous populations included poultice for wounds, and treatment for indigestion, swelling, blood poisoning, and seasickness. Cranberries have loads of vitamin C and benzoic acid, a natural preservative, so they made a perfect ship’s provision stored in barrels. Thus, they became a desired commodity in the Atlantic World. Cranberries (Vaccinium macrocarpon), wild in only certain parts of the Northeast and Pacific Northwest, are not an easy plant to grow commercially. Uncultivated stands of cranberry are now rare but Native Americans once had large ranges to harvest and no need to cultivate the berries as a source for the food. The cranberry plant is particular to its environment, with a short Fall season, needing acidic soil, coarse sand, abundant water, and lack of frost while growing. 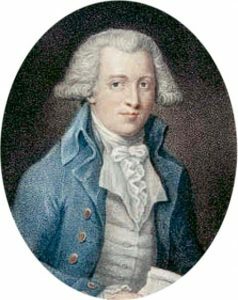 But beginning in 1816, Revolutionary War veteran Henry Hall, captain of the schooner Viana, began successfully to cultivate vines in Massachusetts. By then, the wild environment was quickly receding in America, along with the naturally growing indigenous fruit and the native inhabitants. Thus, there are layers to the story before cranberries became a major commercial crop. Early writings found in the Smithsonian Libraries help to recover and inform an early cultural history of the native cranberry—along with the blueberry and Concord grape—the most American of fruits. 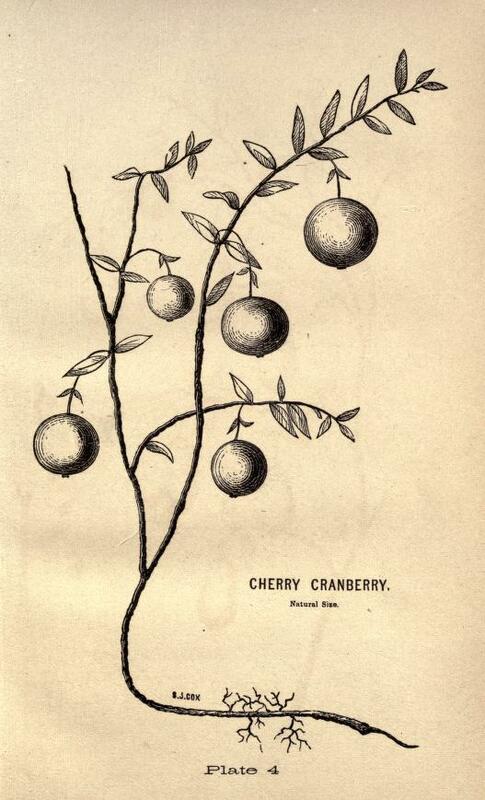 B. Eastwood’s A Complete Manual for the Cultivation of the Cranberry (New York: C.M. Saxton, 1856). BHL scan of University of California Libraries holding. Sarah Whitman-Salkin, “Cranberries, a Thanksgiving Staple, Were a Native American Superfood,” for National Geographic, November 28, 2013 (link here). “Cranberries: The Most Intriguing North American Fruit,” The American Phytopathological Society site. Stephen A. Cole and Linda S. Gifford. The Cranberry: Hard Work and Holiday Sauce. Gardiner, Maine: Tilbury House Publishers, 2009.